← Should you worry about Euro values? For the last year there have been many pundits of the “glass is half-empty” type forecasting a double-dip recession. They’re talking about whether growth in GDP will go negative again just a few months after recovery began. I thought I’d have a look back at the drivers of the world economy, and some past history to give us some perspective. For much of the last two decades, world economic growth has depended on, predominantly, the US consumer. Asian growth was predicated on their economies being able to produce cheaper goods; European growth depended (but to a lesser extent) on exporting luxury goods to the US. Naturally, Europe also sucked in cheap imports from the Far East, and as the Asian Tigers became richer they in turn demanded European luxury goods too. World Economic Growth rates went up and down dependent, amongst other things, on employment levels in the US. The more people there were earning wages, the more money was available for spending. After the credit crunch, unemployment levels more than doubled in the US – and rose in many other countries too. This is characteristic of recessions, and can be used as a measure of how much capacity for spending an economy has. 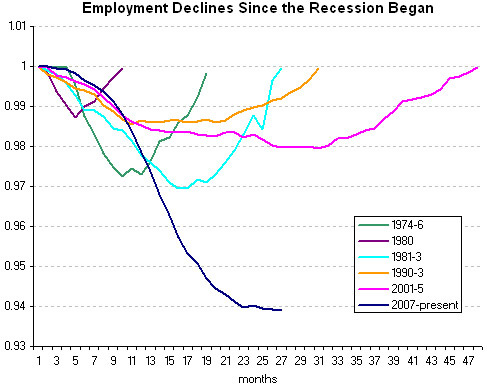 Checking the employment situation is a good way of assessing where in the recession/recovery cycle we are right now. One thing to remember though that unemployment is a trailing indicator, meaning it changes about six months after the economy changes. That’s common sense really – when things go bad, companies seldom make redundancies immediately, after all, the down may just be a temporary blip and they don’t want to get caught out short staffed and watch their competitors sell into their markets. Plus employment laws and union arrangements have to be borne in mind too. The same applies for re-hiring staff: companies don’t want to make a commitment to higher overheads if the economy isn’t really growing. The most noticeable thing about the chart above is just how big the drop in employment has been in the recent recession. It’s nice to see the curve flattening out though as that indicates the worst is behind us. If the pattern of previous events is replicated, even approximately, the effects of any “false dawns” such as double dips looks to be limited: all of the major drops occurred in the first part of a recession. So, looking forward from now economic history suggests that we are presented with an interesting opportunity. The most likely outcomes are return to growth, or a period of stasis. In both cases the low likelihood of losing money is outweighed by the profit potential, in my opinion. There is one fly in this ointment though. Since unemployment is a trailing indicator (roughly six months behind) and investment markets are leading indicators (about six months ahead) all of this analysis only shows us what has happened over the last year: a return to growth. The charts do show that when there has been a double dip recession, the effects were not as bad in the second half as in the first. Let’s build on this. How about comparing now with the average length of past recessions, and the average length of periods of growth that follow them? Luckily these statistics do exist as they are compiled by the US National Bureau of Economic Research. They’ve tracked the US Business Cycle Expansions and Contractions since 1854. These figures show us that between 1854 and 2001 (32 business cycles) the average length of time from peak to trough in the US economy was 17 months. Between 1945 and 2001 (10 cycles) it was 10 months. NBER have already said the last peak was in December 2007, while the Bureau of Economic Analysis show that the latest two quarters showed positive US growth. That’s roughly 19 months from trough to beginning of first growth quarter. In the fourth quarter of 2009, the United States economy expanded at an annualized rate of 5.9% giving the impression that the recovery in (the) world’s largest economy has been stronger than expected. Yet, growth was mainly due to inventory rebuilding and the recent economic expansion may be short lived. Indeed, on a year over year basis, the US economy grew only 0.1%, which is not very strong having in mind that in the last three months of 2008 US output deteriorated by 1.9%. Moreover, surprising strong expansion in the fourth quarter of 2009 may not last in 2010 as 3.9 percentage points out of 5.9% growth came from inventory rebuilding. That may not be as bad a thing as all that though – deducting the 3.9% inventory building (basically, making more stuff than people are buying) still leaves an annualised growth figure of 2%. OK, it isn’t the kind of meteoric growth that many people have become used to, but perhaps this hunger for high levels of growth is unsustainable anyway. The 90’s rapid growth had a lot to do with the end of the cold war and a consequent reduction in government spending on the military. Most investors will have seen a return to growth in their portfolios last year. If recovery is already under way, how long might it last? The NBER figures show the average peak to peak length as 4 years 8 months (1854 to 2001) or 5 years 7 months (1945 to 2001). So, the average growth period has been about five years, give or take half a year. That would take us up to the end of 2012. The average trough to peak time supports this estimate too. From 1854 to 2001 this averaged 3 years 2 months; from 1945 to 2001 the average growth period was five years seven months. But in all cases, remember that past performance may not be repeated and these are only averages. What could this mean for investors? As a rough rule of thumb you can say that in any five year period, there will be one year of exceptional growth, one of losses, and three of moderate gains. Since we’ve just had one really good year in 2009, that suggests three out of the next four years will provide moderate growth. However, this has to be reassessed each year. What we’re really looking at here is the probability of growth or loss, and my five year rule of thumb should really be thought of as suggesting that at any time there is a 20% risk of seriously good gains, 20% risk of loss, and 60% chance of zero to moderate growth. These figures then vary depending on which part of the Business Cycle we are in. So, as we are closer to a trough than a peak in the cycle, staying invested makes sense. Adding more money into your portfolio could be profitable too. With three year average growth for many investment funds still being in negative territory, the headroom for recovery still exists. If some companies fall by the wayside, this will open up the playing field for their competitors to gain market share and profitability. This, together with enhanced Mergers and Acquisitions activity, will push up share prices. Long term, the effects of the actions that have been and are being undertaken now to save the world from depression are likely to bring inflation and high interest rates back into the picture, which is when cash will not be the place to keep your money. In my opinion interest rates should have gone up in December, but only slightly – but that’s a different story. It takes about a year for the effects of monetary policy to take effect and politicians and politically influenced independents or academics with reputations to lose like to wait before they act – but that means they are usually behind the curve. The question you should ask yourself now is, how much of the current recovery will you let go by before you decide to invest again? This entry was posted in General, Investments and tagged Asia, Asian Tiger, Business Cycle, Cash, Credit Crunch, Double Dip, Economy, employment, Europe, GDP, Inflation, Investments, Recession, Stock Markets, US. Bookmark the permalink.